Iconic and inspiring, helium-filled balloons were one of aviation’s first success stories – and one of the longest-standing. Since 1783, balloons such as the Jules Verne have remained in the skies, still flying today. Authentic Models’ dedicated replicas come complete with a rattan basket, hand-knotted netting and even sand bags at the ready! Made from lightweight plastic, with rope, sandbag and woven basket detailing. Loop at top for hanging. 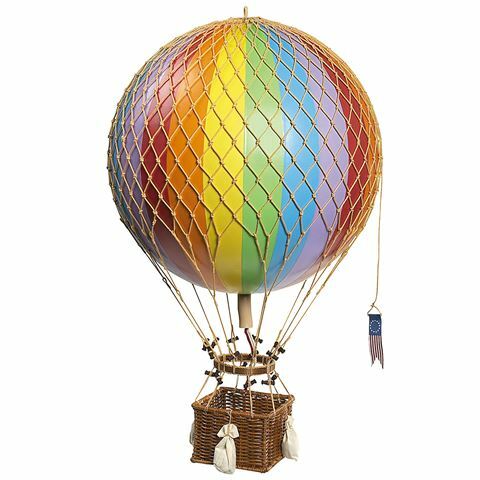 Please note that due to the fragile nature of the Jules Verne Balloon model, it is available in-store only.